Will Plastic Man Strike Again … again? Comic Book Resources recently posted an article about the upcoming “The Dark Knight III: The Master Race,” which is frankly a comic I almost could not care less about. In spite of the presence of writer Brian Azzarello and artist Andy Kubert on the project, both of whom are creators I tend to like quite a bit, I’m pretty much done with original Dark Knight creator and Master Race collaborator Frank Miller. As it is, I only enjoy current Batman stories about half the time, so I’m pre-soured on the whole thing to the point of ambivalence. The point is that during the interview (you can read the spoiler-laden article at the website) Kubert and Azzarello were asked what characters could be expected to show up. Specifically mentioned as possibilities were Green Arrow, who played a major role in both the original The Dark Knight Returns and its follow-up, The Dark Knight Strikes Again, as well as Superman, Wonder Woman, and their daughter (and maybe more offspring?). But I thought you said in comic books, nobody is ever really dead. Azzarello: Well, he [Martian Manhunter] got burned. [Laughs] And you know what? In “DKIII,” it does matter. But we’re going to hit the remaining, living members of the Justice League. The Atom is in it. We’ll be continuing the story of the characters you’ve seen before. And that’s what caught my attention, because Batman’s longtime buddy Plastic Man was one of the heroes rescued from the clutches of Lex Luthor in DKII. I can’t say the Miller version of Plas is one I particular care for, but it would be nice to see him in a comic again (especially coming so relatively soon after his appearance in Plastic Man and The Freedom Fighters). And hopefully Azzarello would keep him from being as over-the-top and out of character as Miller depicted him and everyone else in Strikes. Unless they bring back Elongated Man (also featured in Strikes) and leave Plastic Man out altogether. That would be … oh, man. I’ll just let Plas sum it up. You keep telling yourself that, Ralph … keep telling yourself that. It’s Plastic Man, the Silver Surfer, and the spirit of Mego! I’ve been falling behind on posting again, so we’ll be doubling up on the updates this time around. 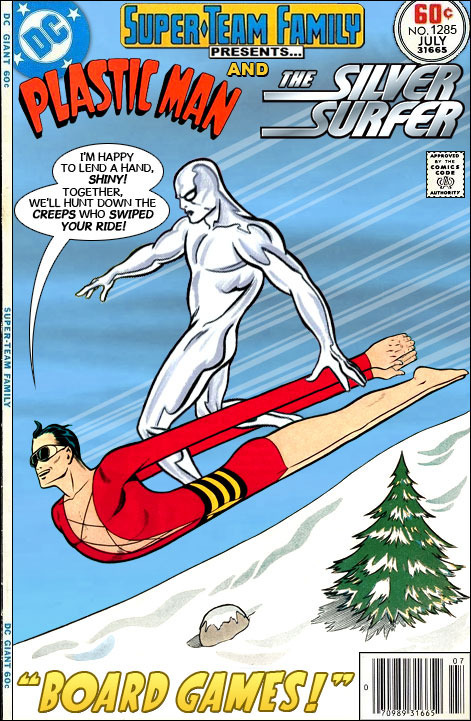 First up is Plastic Man’s latest appearance over on the Super-Team Family blog, with Ross Pearsall matching the pliable paladin up with that Sentinal of the Skyways, the Silver Surfer! Bonus points for that clever issue title, by the way. Ross always does a great job with this team-ups that never happened (but should have), and Plastic Man has been lucky enough to have make semi-regular appearances over the years. This pairing is particularly appropriate thanks to Mike Allred, the Silver Surfer artist seen here. Allred, who readers might know from his lauded creator-owned series Madman, also created a Madman spinoff called The Atomics. And in The Atomics there is a character called Mr. Gum who is pretty obviously based on a reformed-crook-turned-elastic-lawman. I mean, we’re talking right down to the suit colors and eyewear, which you can see in another of Ross’ mash-ups. Neat, right? 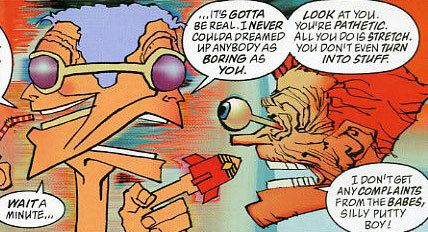 I’d have to say Plastic Man still has the better codename, though. Next up is something we won’t be able to get our hands on until February, but it will be more than worth the wait (and the $30 price) — a Mego-style Plastic Man! Other figures released as part of the series will include a Hal Jordan Green Lantern, the Flash, and a fairly awesome Martian Manhunter. Of course Plastic Man is at the top of my list, not least of all because (as far as I can tell) this is the first time the character has gotten the full, production-line, Mego treatment. 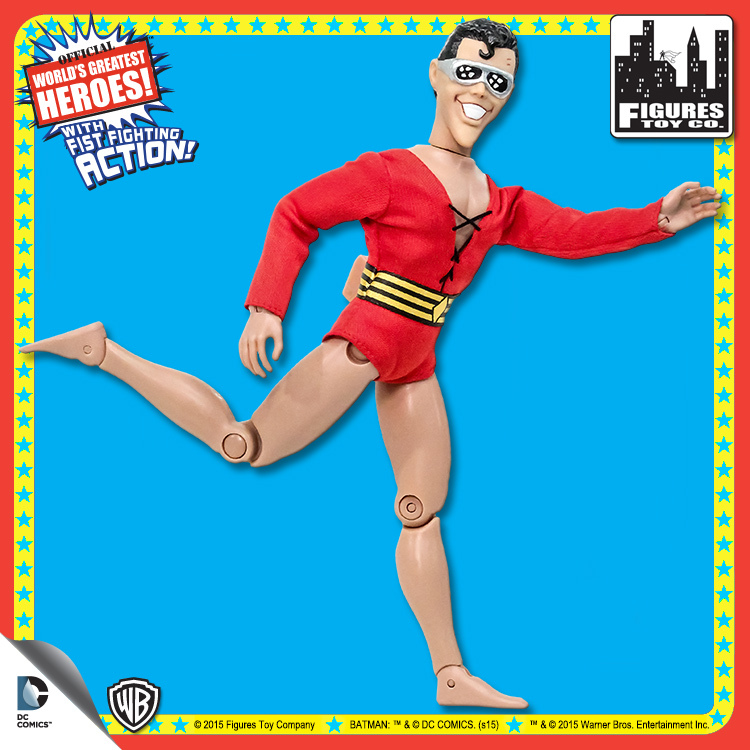 There was a Mego Plastic Man that was like Stretch Armstrong, but this is closer to a more traditional Mego. What I’m getting at is, Christmas is only a couple of months away. That’s all I’m sayin’. Special thanks to Anthony Durso for pointing me to the Plastic Man figure. You can catch up with Anthony on Twitter, and check out his custom Mego packaging for Plastic Man at the Mego Museum site (it’s next-level stuff, guys)! Earlier this month, DC Entertainment officially launched DC Super Hero Girls, an initiative designed to welcome younger girls into the DCU in all its alternate realities, namely toys, clothing, digital platforms, animation, and — oh, hey — comics and graphic novels. This is, of course, a good thing, and way overdue. The character designs look great, and the Super Hero High School concept is an always-popular setting. And while the large cast, reflecting most real-life high schools, has both boy and girls in attendance, the focus is rightfully going to be on characters including Wonder Woman, Batgirl, Katana, Bumblebee, Harley Quinn, and others. Eeyow! Plastic Man is back on screen! Does this mean Plas is a graduate of Super Hero High? Is this just a cameo, or will he be making more appearances? Is that Liberty Belle back there? And how awesome is Mortar Board Sandman? I don’t know the answer to any of these questions because I’ve only watched the first episode, but there are three up already that you can watch at the DC Super Hero Girls site. All I know for sure is I’m glad the WB Animation folks haven’t forgotten about Plastic Man, even if it seems like the DC Comics people have.